Our highly trained and dedicated staff is what sets Bowlers Advantage Pro Shop apart from our competition. Each staff member is an IBPSIA Certified Pro Shop Technician (International Bowling Pro Shops & Instructors Association) – for this certification each staff member attended an intensive 32 hour hands-on training class. We also stay “in the know” by attending manufacturer seminars and industry training clinics on a regular basis to ensure continued education in our ever evolving sport. We are extremely proud of our staff as we believe that without them, we would not be successful at providing “Experienced Striking Results” for our customers! 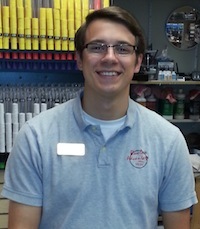 Donnie Richardson is the manager of our Smyrna Bowling Center location (95 Weakley Lane, Smyrna, TN 37167, 615-223-6704). Donnie has been with Bowlers Advantage Pro Shop since 2000. Donnie has completed Ebonite’s Powerhouse pro shop training program and has earned his IBPSIA Pro Shop Technician Certification. He actively attends as many industry seminars as possible to keep informed on the ever changing technology in today’s bowling game and to keep up his IBPSIA continuing education requirements. Donnie is a USBC Bronze Certified Bowling Instructor/Coach and is available for lessons. Donnie is the Head Coach for the Smyrna High School’s bowling teams. In January, 2009, the Boys team won the state championship title for the fourth time! Donnie also helped lead the Boys team to back to back state championship wins in 2006 and 2005! Go Bulldogs! Donnie began his love for bowling when he picked the game up in 1978. He continues to bowl competitively and has rolled games of 299, 300 and an 801 series. Donnie is passionate about helping others enjoy the game of bowling. He takes his time with his customers and strives to offer the best customer service available. Chris Gillis has been working for BAPS since 2007. 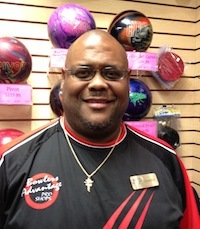 Chris is an IBPSIA Certified Pro Shop Technician and a USBC Level One Certified Bowling Instructor/Coach and he is available to give individual bowling lessons. He currently attends Middle Tennessee State University. Chris was a member of the Smyrna High School’s men’s bowling team that took the State Championship title in January, 2009! Chris has proven to be an asset to Bowlers Advantage as he enjoys working with customers and increasing his knowledge about ball motion and drilling layouts. 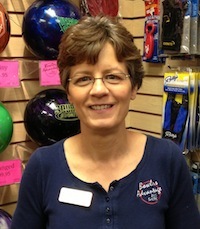 Michelle Rakow is the owner/operator of Bowlers Advantage Pro Shops, LLC. She has been in the bowling business since working at a bowling center when she was a youth bowler. Michelle attended both Vincennes University and Indiana State University on full academic/athletic scholarships where she studied for her Associate, Bachelor, and Masters degrees. While at both Universities she bowled on the women’s collegiate bowling teams. Michelle and her college teams enjoyed great success winning several collegiate tournaments along with winning berths into the National finals all four years. She also enjoyed many individual collegiate accomplishments such as being named Collegiate All-American. She has since won numerous singles/doubles/team/all-events titles throughout the Southeast and continues to bowl. Michelle founded Bowlers Advantage Pro Shops with her husband in 1993. Along with running her pro shops and giving bowling lessons/clinics, Michelle also teaches aspiring pro shop operators how to run successful pro shops through one on one training, seminars, and classes that she conducts within the industry as an IBPSIA Certified Instructor. Michelle strives to offer the best customer experience possible at her pro shops by providing her top notch staff on-going training on important topics such as excellent customer service and up to date industry knowledge.